Visiting Scholar Fellowship to conduct individual in-depth research on the topic of session-based recommendation at University of California, Los Angeles. For the 27th ACM Conference on Hypertext and Social Media (HT’16) in Halifax, Canada. For Data Market Austria (DMA), IKT der Zukunft, 286k€ for the Know-Center as technology contributor for the recommender system-based brokerage platform. At the 15th International Conference on Knowledge Technologies and Data-Driven Business (i-Know’15) in Graz, Austria. At the 25th ACM Conference on Hypertext and Social Media (HT’14) in Santiago, Chile. For the final Master year at Karlsruhe Institute of Technology in Karlsruhe, Germany. 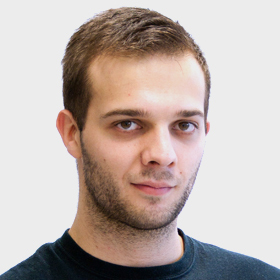 Emanuel Lacić is a Senior Software Engineer and Scientific Researcher in the Social Computing division at the Know-Center, Austria's leading research center for data-driven business and Big Data analytics. Additionally, he is a PhD student at the Institute for Interactive Systems and Data Science (ISDS) of Graz University of Technology. He is a former Marshall Plan fellow and has been working as a visiting researcher at the Computer Science department of the University of California, Los Angeles (UCLA). He has a M.Sc. and B.Sc. in Software Engineering and Information Systems from the Faculty of Electrical Engineering and Computing at the University of Zagreb. He is currently doing his PhD at Graz University of Technology in the course of the European-funded project Learning Layers on real-time recommender systems in large-scale settings. Apart from that, his research is utilized in several industry and European-funded projects such as AFEL or MoreGrasp. His main research interests are in the fields of Recommender Systems, Deep Learning, Information Retrieval, Big Data, as well as Social and Complex Network Analysis. Lacic, E., Kowald, D., Reiter-Haas, M., Slawicek & Lex, E.
Lacic, E., Kowald, D., Eberhard, L., Trattner, C., Parra, D., & Marinho, L. B.
Lacic, E., Traub, M., Kowald, D., & Lex, E.
Lacic, E., Kowald, D., Traub, M., Luzhnica, G., Simon, J., & Lex, E.
In Proceedings of the 9th ACM Conference on Recommender Systems (CEUR-WS RecSys'2015). Lacic, E., Kowald, D., & Lex, E.
Kowald, D., Lacic, E., Theiler, D., & Lex, E.
Duricic, T., Lacic, E., Kowald, D., & Lex, E.
Lacic, E., Traub, M., Duricic, T., Haslauer, E. & Lex, E.
it - Information Technology, 60(4), pp. 219-228. Reiter-Haas, M., Slawicek, V. & Lacic, E.
Lacic, E., Kowald, D. & Lex, E.
Traub, M., Lacic, E., Kowald, D., Kahr, M., & Lex, E.
In Proceedings of the 27th ACM Conference on Hypertext and Social Media (HT'2016), pp. 249-254. ACM. Traub, M., Kowald, D., Lacic, E., Schoen, P., Supp, G., & Lex, E.
Dennerlein, S., Kowald, D., Lex, E., Theiler, D., Lacic, E., & Ley, T.
Trattner, C., Kowald, D., & Lacic, E.
In European Conference on Technology Enhanced Learning (pp. 514-519). Springer Berlin Heidelberg. Management, lead development and consulting on industry projects in the domain of recommendation systems. Knowledge extraction and, construction and utilization of social network data with the objective to deliver relevant information to businesses and users. EU funded project Learning Layers, supported by the European Commission within the 7th Framework Program. Ruby development on internal central administration and monitoring solution used by the Data Center Infrastructure Management (DCIM) and IT Operations (ITO) departments. Project development through Scrum. Developing for the Mirror project (co-funded by European Commission IST 7th Framework Program). Design, development and maintenance of enterprise applications in the field of mobile cloud services (SMS, HLR, USSD, etc.). Design, implementation and testing solutions for the information system of primary healthcare. Fadljevic, L. (2017) Analysis and Prediction of Movie Preferences. Master Thesis. University of Zagreb, Faculty of Electrical Engineering and Computing (cooperaton with the Know-Center in Graz, Austria). Duricic, T. (2015) Real-time recommendations based on social trust. Master Thesis. University of Zagreb, Faculty of Electrical Engineering and Computing (cooperation with the Know-Center in Graz, Austria). TagRec - Towards A Standardized Tag Recommender Benchmarking Framework. Layers - The Learning Layers Technical Infrastructure.